Are you a Student Connector? Helping students of all ages and stages build supportive communities has never been more important. The Master of Arts (M.A.) 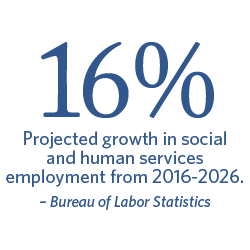 in Human Services – Human Services for Student Affairs will prepare you to help students thrive in their academic and personal development, whether you prefer administration or hands-on assistance roles. Courses are taught using a combination of real-time interaction with professors, small-group projects, podcast lectures and asynchronous chat room discussion. Learn how to grow in leadership, advising, administration, and supervision. Study and practice how to bring forward positive change during the highly transformative "student" season. Our award-winning faculty – in Virginia Beach and beyond – are here to help you pursue your master's in student affairs from a Christian worldview. Study legal issues that shape colleges and universities today. Investigate constitutional provisions and federal statutes influencing higher education policy. Develop strategic procedures that help the young adult and nontraditional higher education culture. Explore strategies and goals that enable the mission of Christian education centers to succeed. An examination of issues relevant to college students. Topics may include intellectual growth, moral development, values, career choice, psychosocial changes, and the role of extracurricular activities. Cross-listed with EHEA 801. Provides historical and contemporary legal issues that have and will continue to shape colleges and universities today. Discusses legal issues regarding the college and trustees, administrators and staff. Investigates the legal basis of higher education in the United States to include constitutional provisions and federal statutes that influence higher education policy. Prepares emergent administrators for preventative law measures in an increasing litigious environment. Cross-listed with GOV 628 and EHEA 803. An examination of the historical underpinnings of student affairs, the numerous departments under student affairs, the administrative interaction between student affairs and other university departments, and administrative theory relevant to the student affairs administrator. Centers on the need for the continuance of Christian colleges and universities in a post-Christian culture. Particular emphasis will be placed on the strategies, objectives and goals that can best ensure the future continuance of the spiritual mission and Orthodox beliefs of Christian colleges and universities. Cross-listed with EHEA 702.